Now I Feel MUCH Safer. Ha! Saw this earlier on FB. We are blessed here…no tornadoes, or such….just the monsoons…but that isn’t too bad. It’s something like how the telecommunication companies in my country only give you their email address to contact them if there is a problem..which is *so* smart as the problem if it occurs would be internet problems!!! D’oh. I wonder if there’s a subscription service for emailed extraterrestrial invasion warnings. Because it *could* happen, you know. I get my tornado warnings by mail through Canada Post. 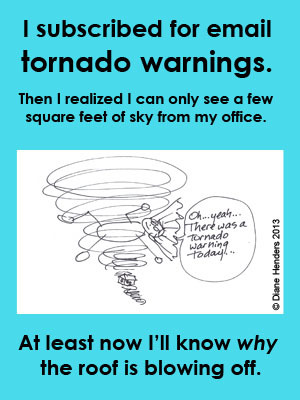 Can anyone sign up for those tornado warnings? I need more mail in my in-box. Oh, I’m sure your local weather site will be delighted to stuff your Inbox. For this particular one, I set up Outlook to monitor the RSS feed from Environment Canada’s weather warnings for Calgary. Problem is, they update the RSS feed every half hour or so, even if there are no warnings. I was getting 48 messages a day saying “there are no warnings”. So then I had to write a rule in Outlook to automatically delete the ones that said there were no warnings. I haven’t had a warning since, so I don’t know whether our weather has suddenly turned very stable, or whether the rule is actually deleting all Environment Canada’s RSS feeds now. I’d probably miss the email though as it gets flagged as spam, and then miss the tornado as a result. My heart returned to it’s rightful spot and I did my best not to laugh, bless her heart. Your cartoon gave me another nice memory. Thanks! Oh, that’s so cute! (Once you got over the fear, anyway.) A tornado passed over our campsite last summer and touched down a few miles away, so I know exactly what you mean by the train sound. The problem was, our campsite is surrounded by trees, so I still couldn’t see the sky – we weren’t sure it was a tornado until we left later in the day and saw the destruction a few miles east of us. I’m beginning to regard tornados the same as I regard lightning strikes – I’ll do my best not to do anything outright stupid, but if I’m gonna get hit, I guess it’s just my time. 7 books eh? Well done.